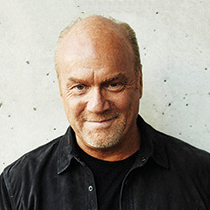 In the first segment of his three-part interview by the Billy Graham Evangelistic Association, Greg Laurie talks about finding our identity in Christ and turning to Him when we're afraid. Being a tween, teen, or young adult can be a time of personal insecurity because we are looking for a place to root our identities. In thinking about how you gave your life to Christ when you were a young man, how did you find security and confidence as a young person? I had very little to be confident in, humanly, when I came to Christ. I was illegitimate; my mother had been married and divorced seven times, and I had lived most of my childhood in an alcoholic home. But a verse from the Bible really spoke to my situation. It was Psalm 27:10: “When my Father and Mother forsake me,the Lord will take me up.” By the way, those words were written by David, who knew a lot about being forsaken by his father. You remember when the visiting prophet came to David’s hometown, looking for the future king of Israel (which turned out to be David)? Jesse, David’s father, would not even acknowledge him, instead pushing his other sons, who he obviously was much prouder of. We all have to deal with setbacks in life. So, my security—my identity—is in my relationship with Jesus Christ. My point is, if He can do it for me, He can do it for anyone! I have written my life story at length in a new book called Lost Boy if you want to know more about how God can bring good out of evil. Jesus said often, “Do not be afraid…” What exactly was he telling others not to fear? What can we do to combat different types of fear? There is a lot to be afraid of in this crazy world we are living in today. Terrorism, an unstable economy, and all those personal things we deal with, like our marriages, children, etc. Worry does just that. It chokes out your faith and replaces it with anxiety. It pulls you apart and completely immobilizes you. Worry is the advance interest you pay on troubles that seldom come. So, what should we do instead of being filled with worry and fear? We should pray. Paul was in prison when he wrote, “Don’t worry about anything; instead, pray about everything. Tell God what you need, and thank him for all he has done. If you do this, you will experience God’s peace, which is far more wonderful than the human mind can understand. His peace will guard your hearts and minds as you live in Christ Jesus” (Philippians 4:6-7NLT).